The one-of-a-kind show brings together inspirational leaders and respected industry experts from the apparel, manufacturing, retail and affiliated business industries to educate, network and share. Apparel Textile Sourcing is the apparel industry's link to the entire global supply chain. The 2019 show will see participation from popular branded companies from across Asia. 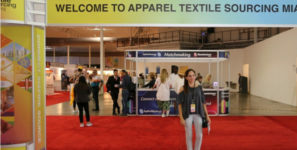 Following the enormous success of its inaugural show this past spring, Apparel Textile Sourcing Miami (ATSM) – the largest apparel and textile sourcing show in the Southern U.S. and Latin America – has announced its return to Miami in 2019, double in size and bringing thousands of out-of-state and international visitors to the Magic City, according to press release highlights. Produced by JP Communications Inc., publishers of TopTenWholesale.com and Manufacturer.com, ATSM 2019 will take place May 20–22 at the Mana Wynwood Convention Center. The show – which has attracted the attention and support of manufacturers and industry partners across the globe – has received a $2 million investment infusion to support its growth from JP Communications and the China Chamber of Commerce for Import and Export of Textile and Apparel (CCCT), the largest textile and apparel trade agency in both China and the world. “The Apparel Textile Sourcing Miami Show will bring a large number of domestic and international industry decision makers to our community, promote Florida as a premier destination for the industry and stimulate the local economy,” said Manny Mencia, Senior Vice President of International Trade and Development for Enterprise Florida. Local supporters include Moishe Mana of Mana Wynwood, City of Miami Mayor Francis Suarez, Miami Dade County Mayor Carlos Gimenez, Commissioner Dale Holness from Broward County, Commissioners Jose “Pepe” Diaz and Audrey M. Edmonson from Miami Dade County, Dr. Shanjie Li, Executive Chief Economist and CEO of Miami-based American Da Tang Group, as well as organizations such as the Greater Miami Convention and Visitor’s Bureau, the Broward County Office of Economic and Small Business Development, the Port of Miami, the City of North Miami, Port Everglades, Florida East Coast Railway, the Council of International Fashion Designers, Fashion Group International, Greater Miami Convention and Visitors Bureau, the Beacon Council, the City of North Miami, Enterprise Florida and Miami International University. CCCT Chairman Mr. Cao Jiachang said the 2019 show will see participation from popular branded companies from across Asia in addition to a wide range of suppliers and products. “These are all highly successful, leading apparel brands in China, looking for U.S. partners to represent them in America and help grow their brands globally,” he explained. “Thousands of top buyers from more than 40 countries are expected to attend ATSM 2019 to source, connect and develop lasting relationships with qualified international and domestic suppliers,” he said, citing as examples ATSM notable buyers from Kate Spade, HSN, Perry Ellis, Zara, Gap Inc., Chico’s, Macy’s, Disney, Zumba, Fountainbleau, Hard Rock, Royal Caribbean, Levi’s and Westgate Resorts. The ATS brand debuted in 2016 in Canada, with the successful ATS Canada show, and has established its reputation as the major marketplace for Canadian, US, Latin American and Caribbean buyers to see, select and source apparel and textiles from the most reliable and price-competitive international manufacturers in the world. In three short years, the organization has grown to include ATS Miami, Montreal Matchmaking, and will debut their fourth show,ATS Germany, in September 2019. “There is no better trade show to expand your factory and production opportunities for finished garments, contract manufacturing, and private label development than an ATS show!” Prescott said.